Going to Anime Expo? Interested in Hatsune Miku? Then be sure and check out this exhibit! Greetings, you have found your way to Otaku no Podcast, your source for anime and manga news, reviews, and commentary. Be sure and check out the rest of our website, and while you're at it, why not subscribe to our podcast as well? (it's free!) Enjoy your stay! In our recent episode on budgeting for an anime convention, we recommended that you should set aside some money for those “oh crap!” type moments — accidentally overspending on something, dealing with various forms of Travel and/or Con Drama (lost luggage, roommates you just don’t get along with, etc.) and so on. Well, another (more positive) reason that you may want to keep a little bit of extra money in your budget is that, while you’re at con, you might catch wind of some cool and/or fun event that happens to be in town while you’re at con, that you might want to take an evening to go and visit. Having a little extra cash on hand makes this kind of serendipitous event possible. Case in point: if you’ll be going to Anime Expo, and if you are a fan of (or are even at least a little bit interested in) Hatsune Miku and/or Vocaloid in general, then you might want to check out this cool event hosted at the Gallery Nucleus, a mere 12 miles from the LACC. 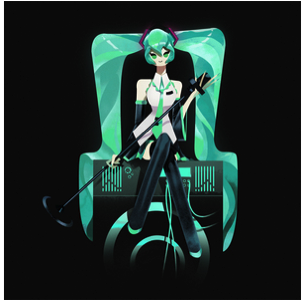 “Hatsune Miku Dreams of Electric Sheep” is an exhibit being put on by Crypton Future Media in partnership with Gallery Nucleus, and features an exciting line-up of original art featuring our favorite blue-haired, leek-wielding virtual diva, Hatsune Miku. The exhibit features a large and exciting collection of original art featuring Miku & Co. done by various artists, each depicting Miku in their own unique artistic style. This collision of worlds will no doubt surprise and entertain fans and curious onlookers alike. No items are currently up for auction.